Offering a newfound appreciation for life, Chasing Heaven is the story of Crystal McVea as she experiences something not of this world. Want a newfound appreciation for life? From the author of the New York Times bestseller, Waking Up in Heaven, comes an extraordinary story about Crystal McVea's personal transformation after visiting heaven and how readers can experience heaven themselves-and live a more meaningful life. Ever since Crystal's incredible experience, her life has been profoundly different. She has become a brand new person in every conceivable way-heart, mind, soul, and spirit. By dying, Crystal learned how to live. Crystal realised that heaven is real and our true home, but we are still meant to have meaningful lives full of passion and purpose right here on earth. She believes we have to chase heaven while we are still alive and allow God to turn our lukewarm love into a firestorm of faith. Chasing Heaven is the story of how God called to Crystal, what He told her, and how she found a way to get closer to Him again here on earth. The journey that followed Crystal's time in heaven has been difficult, complicated, and surprising-full of twists and turns, setbacks and triumphs, drama and comedy, and everything that makes life so messy and beautiful. 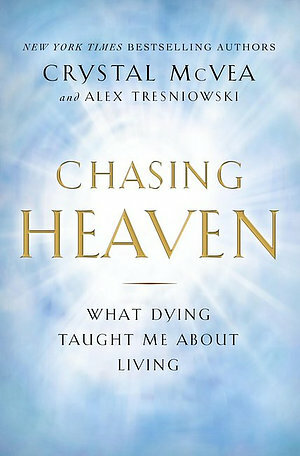 Chasing Heaven by Alex Tresniowski; Crystal McVea was published by Authentic in April 2016 and is our 2670th best seller. The ISBN for Chasing Heaven is 9781780781587. Be the first to review Chasing Heaven! Got a question? No problem! Just click here to ask us about Chasing Heaven.